In Peter Jackson’s LOTR film, the first moment of Gandalf arriving in Hobbiton and finding Frodo waiting on the trail were critical because it established two essential characters and the setting of Hobbiton. It also introduced audiences to the scale of Hobbits with human-sized characters including forced perspective of Frodo riding in Gandalf’s cart. The meeting serves as the entry point for Lord of the Rings LEGO as well with set 9469 introducing important characters in an easy-to-build kit that is also easy to afford at $12.99 retail in the U.S. It will likely find itself as birthday present to and from friends many times over. Because it is recommended for ages eight to 14, I enlisted Logan (8) and Dresden (10), to assist with the build of the kit. To be transparent, it was also my first ever LEGO kit. Even as a kid, while I probably played with the bricks here and there, I never had one set of my own to start and finish on my own. 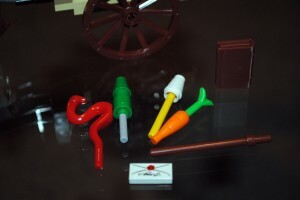 The instructions are visual, not written, serving the several languages the sets are sold to. 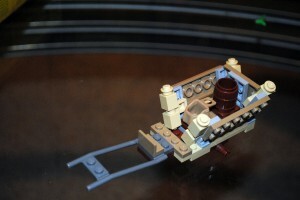 LEGO vets will be used to that but it was new to me and probably a lot of other potential builders as well. I didn’t know what to expect so I took the instruction booklet’s visual advice and put everything on a table to start. The set came together quickly as my two child testers and I took turns completing one page each at a time and then observing until it was our turn again. Things fell into place nicely and with such a small kit it was easy to see immediately where things were going. By far the most interesting bits were crafting characters together and I was stuck with the horse while Gandalf and Frodo were battled over. I realize there may be expert LEGO craftsman out there reviewing kits and finding nits to pick, I confess to not only not being aware of what others have written about the set but carefully avoiding any opinions so as not to cloud my own. The box is modest sized, easily fitting in one hand, clearly labeled as a Lord of the Rings set in three languages on the side with a clear picture of what is actually found inside on the cover. The branding is clear and pleasing with the appropriate logo and the finger of the book’s title character wearing the One Ring. The nice matte painting in the background of the set on the cover isn’t inside of course. The back of the box showcases some of the play scenes you can expect to re-create. 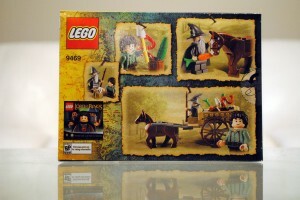 It also teases to the LOTR LEGO video game, something I am quite looking forward to. The bricks come in separate plastic bags and like my colleague Chris in his review of the Shelob Attacks set, I expected the items to be organized per bag as they would be needed to build. Not so. I found it easiest to just open everything as construction starts and set everything out flat to unhide it all. The booklet’s visuals were clear and easy and I loved the last couple of marketing pages that showed the Mines of Moria kit (also reviewed by TheOneRing.net) and then a two-page spread of many of the characters available in the various LOTR sets on the market. Without a doubt, the highlight of this kit, maybe of all LOTR kits are the characters. LEGO wisely puts them in pieces, asking the user to build. This allows for mix-and-match parts, something funny and easy in the series of LEGO video games and a bit of a chuckle to try in hands-on play as well. The articulation is minimal but the characters, particularly Gandalf, are fun. Our team was surprised how un-wizard like he looked until he put his beard on. The hat helped but the long gray whiskers were the ultimate transformation tool. However the hat mostly covers his detailed brow while the beard covers his mouth, leaving only his eyes. Gandalf has a single expression, fine since it is hidden anyway. Frodo is displayable with his whimsical half smile or with his worried expression. I suspect nearly everybody will prefer the humorous version but it is nice to have choices here. His hair also made us laugh for it evokes a 70’s disco feeling and yet is correct for Frodo. I wish they had included character cards, probably something LEGO has never done, but I wanted anyway. On one side would be my figure, one for each in the box, and on the back would be a LOTR figure checklist with character names and the set number where they can be found. (LEGO marketing, I am available, give me a call anytime.) My only criticism, and it is so minor I hesitated to mention it, is not being able to see Gandalf’s face better. It just got lost between his low hat and high beard. The bulk of the kit is the wagon. It builds quickly and intuitively but it isn’t overly simple. It has hinges and wheels with axles and it holds barrels, mail and a rider. Both young testers had no trouble at all following the build and easily accomplishing what is asked of them on their turn. It looks good with layered colored bricks, making it feel both film and LEGO appropriate. It hitches nicely to the horse and displays well. 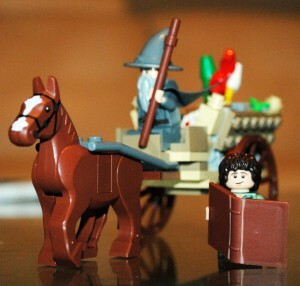 My inexperienced LEGO team did have trouble with Gandalf and the cart. He is shown sitting on the box and we found that a little challenging to make look good and to make stable. His long staff and long cloak made that a challenge. We ended up just standing him up in the cart, easier all around but not film accurate. We didn’t mind. The details really make this all work and LEGO included several great ones. The existence of fireworks here not only is fun and appropriate, it creates an instant longing for Merry and Pippin with soot blackened faces. The great dragon firework is prominent with two other generic ones. Also present is a gigantic book for Frodo that may indeed double as a shield to stop arrows. A carrot and a letter round out the items to fill the cart with and each is as adorable as the next and the combination of all adds the finishing touches that push the set into the must-own zone. This is an entry level set both in difficulty and price point. It was easy for my child test subjects but also so quick that it didn’t come close to taxing their attention span. (Something I cannot say for the Battle of Helm’s Deep set, review pending.) As I am sure it is designed to do, it offers a way to inexpensively sample the LOTR LEGO world. The figures are great and the wagon is probably routine for experienced builders but it simply got me interested in finding something more challenging. I would be surprised if the LEGO-building teens didn’t find this too simple but the cost is right and for those collecting LOTR figures and sets, getting Gandalf and Frodo together is fun. It also displays nicely. 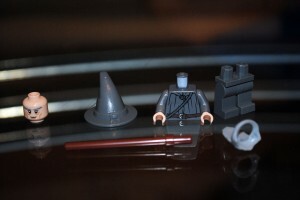 Gandalf will likely be immediately on loan to other sets and would fit nicely in the Mines of Moria kit. So, really, this thing’s cuteness meter is so high it will burn your eyes like an onion. Why are toys made from LOTR movies adorable? I don’t know. But they are! While this has been out in retail for a couple of months, I know many people consider LEGO sets for events and holidays such as Christmas. Those of you who have this set please leave further feedback on our message boards. If you are thinking about a purchse, please do so below so LEGO knows we sent you. Coming soon: Our mammoth review of the mammoth The Battle of Helms Deep set review and gallery. Click the pictures below for much larger versions.